The Swindon Stargazers Club will soon have a fast growing membership, as there are many amatuer astronomers in and around Swindon. It therefore seems prudent to introduce a 'members page' to this website where people can submit articles and comments on the hobby along with viewing logs and anything else that might be interest to members. Members are therefore invited to submit articles that they think may be of interest to others, this be be about anything to do with the hobby that members want to pass onto others. Articles can be short, a one-liner if you like or full page article with illustrations, anything can be accommodated as on any website the possibilties are endless! The only thing to remember is that this is your website and you can make it anything you want, the more information we receive from members, the better this website will be for it. Astronomy is a fascinating subject and as you know, when you look up and see a clear sky (on one of those rare occasions in Swindon), there is always something new to see, always something to fire the imagination as space, and the night sky is vast and contains endless objects, stars, planets and galaxies with which to explore with binoculars or telescope! Don't forget you can email your pictures or illustrations, but please keep the file sizes small at around 100k, if you need help with how to do this please ask using the same link above. The Swindon club is now on the Stargazers Lounge, and is accessed by going to Community> Social Groups> Astro Societies> Swindon Stargazers Club. The group already has a number of members and all you have to do to take part in the forum and become a member of this group is to go through a simple process of registration. You will be sent an email for security purposes and then you have to log back in using the link in the email to confirm your identity. Your login name can be your real name or nickname. So go on, why not join now! 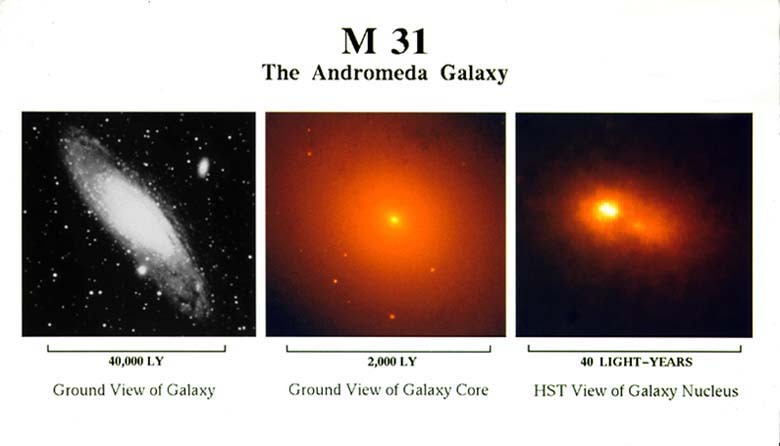 July 20, 1993: A team of astronomers using NASA's Hubble Space Telescope has discovered a "double nucleus" in the center of the neighboring spiral galaxy M31, located in the constellation Andromeda. Exclusive email addresses are available to Swindon Stargazers members such as 'you@swindonstargazers.com'. You will have your own password as well as support in order to set up the account in your mail client. Please note that you must already have an account with an Internet Service Provider (ISP) such as Virgin, BT or Tiscali etc, you will not be able to set up this service with an online mail account, such as Hotmail and MSN. Setting up an account is easy. Full instructions will be provided on how to set up your new mail account, with step-by-step illustrations. Exclusive sub-domains are available to members of the Swindon Stargazers from the website administrator such as 'www.you.swindonstargazers.com'. The provision of a sub-domain is discretionary and initially the club is able to provide 100MB of space, with multiples of 100MB thereafter if required. The provision does not include streaming video etc. Any website designed and used for a sub-domain must be an astronomy or earth-science based website. Swindonstargazers.com will also link to the website, building perhaps what we hope may be a 'family of websites'. Well, you never know! Support and advice will be given to anyone wishing to design their own website. 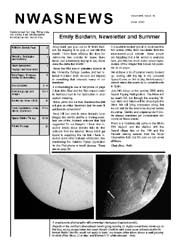 Swindon Stargazers is now included in the Wiltshire Astronomical Society's newsletter, and we are very grateful to Andy Burns, the society's chairman, for allowing us up to a page in each issue as space allows. The new edition is now out, and as usual it is packed newsletter with lots of interesting features and photographs. It also contains details of our current meetings.